UPDATE: Ok, due to the gigantic amount of entries, I will set the deadline for Sunday night, 11:59 EST. Will announce winner at noon EST on Monday. Good luck everyone. Hey guys - I thought I would throw up a contest for the weekend. 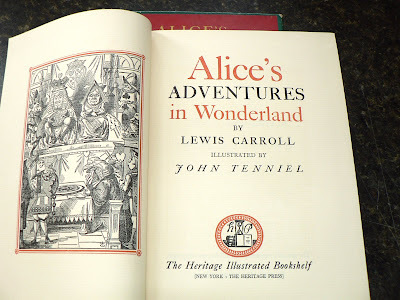 Up for grabs is a 1941 Heritage Press edition of Lewis Carroll's "Alice in Wonderland" and "Through the Looking Glass," complete in one volume. Contains the Tenniel illustrations and comes in a nifty slipcase. Just leave a comment below to let me know you're interested in entering. I'll announce the winner on Monday around noon. Contest is closed. Thanks to all who entered. SWEET !!! Yes, I know I didn't give this story the highest marks in my review. But...the more I discuss it with others, the more I learn and the more I like. Thanks for the opportunity. Hope you're having a good weekend! I would love to win this!!! One of my fave books!! Beautiful. Please consider me "interested." Enjoying your bookmark pics. most interested. it is a favorite text. I'm trying to get my daughter interested in a cheapo dover edition and I have a falling-apart-from-repeated-use Dial edition from 1931 that really needs to be retired or repaired or both. aside from the ruthless self-interest, I am really enjoying your posts. I haven't found any great bookmarks of late and I'm living vicariously through you. Please count me in. I'm a member of a community on Livejournal that is all about literary tattoo's and so many people there get "We're all mad here" and i'm curious about it as i've never read the book before. I've watched the Disney movie edition but I hear the book is so very different and supposedly even better. I am also interested in entering. This would make the perfect gift for someone I know. count me in. Enjoying the posts, keep it up. Wow! Would LOVE to win these fantastic stories! Totally count me in—this is one of my favourite stories, and I'm a complete book design junkie. i haven't read it yet but it's waiting for me in my collection. 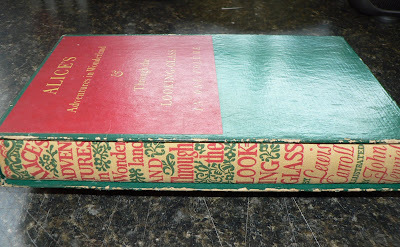 A real favorite--would be overjoyed to have it and love the binding. Oh man I want in. I love this book and love old books in general! I'm totally interested in entering, but since you didn't announce rules--I'm assuming you're just picking the winner arbitrarily. =( Not a very good chance for me then. Ooo I like this binding. 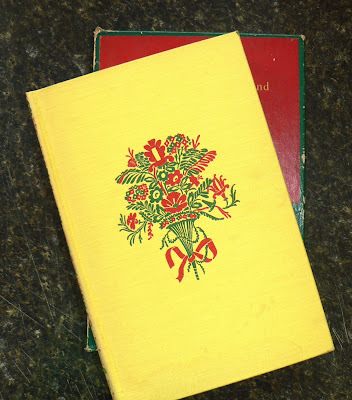 I have just found your site, but I have it bookmarked now :) I love this sort of thing, found objects and old books! I have been looking for vintage Alice in Wonderland copies in used bookstores and antique stores with no luck, it is one of the books that got me introduced into reading. That's a beautiful book, and a great site. Please count me in. Greetings from Chile! This is my all time favourite book, as you can see from my email... My current copy is from the early 40s and falling apart so much that I'm afraid to read it. You would make ma very very happy person if you considered my comment for your copy. This would make a lovely gift for my niece. I also have been collecting bookmarks in old books and ramdom found items for my whole life! Love it. Count me in! I'm new to your site. That's a beautiful book, count me in! That is a pretty book. You sure know how to get me to comment! I am so interested. It looks gorgeous and older books have so much character. One of my favorite books! I'd love to have such a gorgeous copy of it. Wow, I would love this. Such a good prize. It's one of my favorites. I'm in this to win this! Is the answer "Eat me"? Would love to enter the contest. Thank you. A most worthy and decorous prize! I would definitely love to have this book! I would love to win this. Thanks so much. Kinda an odd story, but I'd like to enter the contest with the hope that this will be an amazing gift for a dear friend and mentor. Jump back about a year. I went to college at the National Technical Institute for the Deaf (NTID), where last year we did a production of Alice and Wonderland with a truly amazing director, Jim Orr. He worked with 60+ deaf students to build a world of Alice in Wonderland that was new and inviting, creative and funny. Yes, it was Lewis Carroll, but it had an air of freshness and playful spirit that I never saw in any other spoken or signed (ASL) production. I mean how do you take the genius of Carroll, translate it into another language (sign language), and then put it on stage and keep the youthful emotions and adventures of the original text on a page? Jim is such a supportive, nurturing, and creative person that he touched me in a way I wasn't expecting. I've been hunting for a gift for him for a long time (nearly a year) that would be worthy, and this is the first thing I found that's right. It's hard to find a single gift to thank one of your favorite mentors. That said, if you chose to give me the book, you'll have made my year. Hopefully, his too. this sounds amazingly cool. also, a favorite book of mine. Entry, please! You've got a great thing going here. Awesome contest item. Thanks for the giveaway! Would love to have this!!!! That is a truly beautiful book. I would love to own it. I'd love to have these for my little baby, Alice, when she gets a little older and grows out of the Dr Seuss books. I'm in! I'd love to have that book! Wow, very cool edition of one of the greatest books ever written. Count me in! Count me as one of the potential beneficiaries of this magnificent reward. Here via Metafilter, not willing to let a chance like this pass me by. Life, what is it but a dream?" I think that it was fate that I came here from a random Reddit link. These books are my all-time favorites. I would love to have a copy with the original illustrations. Sign me up for a chance! Yes, I too am interested! Paint me interested and tie me to the queen's kilt! Me! I'll be Mad as a Hatter if I don't win! been meaning to read this. color me interested. I'm in! tcsahin @ gmail /dot/ com! i'm in! that is a beautiful book. Would love to win this, thanks so much for the contest. I would love to win this, please count me in! Incredible prize! Write me down in the "interested" column. Com. Ment!!!! Definitely interested. That's a beautiful printing. quite the collection of found objects, keep up the great posts! Beautiful!! I would *love* to give these to my son! VERY INTERESTED!!! Love both of these classics. That would be amazing. I'd love to read this to my daughter. Love your style. My daughter just started reading 'in Wonderland and adores the story. I would to present her with an edition she could treasure. Wow, this would be great! I am starting a book collection for my soon to be born kid, and this would be a great start! Oh, yes. Count me in, please. Please count me in as well! Lovely! My husband would positively freak out if I won this book. That's a gorgeous looking set. However, I wouldn't it so much for myself as much for my wife. After taking care of both my burns and our son, she deserves it. I don't think they play at all fairly, and they all quarrel so dreadfully one ca'n't hear oneself speak–and they don't seem to have any rules in particular: at least, if there are nobody attends to them–and you've no idea how confusing it is all the things being alive: for instance, there's the arch I've got to go through next walking about at the other end of the ground–and I should have croqueted the Queen's hedgehog just now, only it ran away when it saw mine coming! Er..I mean...count me in. And piling on the "excellent blog idea and execution" bandwagon. Cheers! Oh yes, please, I'd love to be in on this. That is a beautiful book. wow, just found this site and found the gem of a little contest! One of my favorite books. Of course. Sure, I'll get an entry ticket. Why don't more books come with slipcovers? Slipcovers are the armor books need! What an exquisite book! Definitely interested to gift my niece this so we can read this together over at our tea-parties. Oh, I re-read these books every two years or so- love the Tenniel illustrations - they are permanently etched in my mind. COOL PRIZE! I can't believe you want to give it away. And yet, I would happily accept it. I'm very interested. It looks like a really lovely edition! My daughter is 12 and an avid book collector. Her favorite bookmark find is a beautiful little pressed flower. She'd so love to win this book! I want this so bad it's not even funny. That's such an amazing find. I'd like to throw my name into the hat as well. Wow. I'm very interested! PLease sign me up! My, that's one pretty book. I hope it's not too late to enter! I'm definitely interested! This is indeed relevant to my interests. I am extremely interested in this! Beautiful book. Enter me in the contest, too, please. I know just the person to give this book to. Color me interested! That book is gorgeous. Ha, yes, I'd love to have that. Very interested in the book - thanks! Two of my favorite things... old books and Lewis Carrol. Looks wonderful; thank you for the opportunity to win this. Yes! Please enter my name. One of my favorites. Thank you for your offer. Would love to win this! Definitely interested. Love the books, just found but already love the blog, would love to win. Alice is one of my all-time favorites. Please consider me for the contest, too! Great site, would love the book! Found this link through Language Hat - love the site, and consider me entered in the contest! Um, wow, that's lovely. Always been one of my favorite books. Please do consider this an entry in your giveaway. Please consider this my entry. I have 300 plus editions of the Alice books. You should definitely give this one to someone else. But it's a nice prize. It is, as you may have guessed, my favourite book in the English language. If I were you, I'd give it to someone who has never read it. To fall through a tunnel into this strange and wonderful website and then to win the book, too, would be a dream dream too good to be true. Oh that's absolutely lovely. Count me in. What a lovely edition - I'd be thrilled to get the chance to read it. I would be very interested in entering this contest. This would be pretty awesome to win! Please accept my entry as well. Wonderful book that I can read to my son. never read this before. Looks like its in great condition. Wow! It looks in great condition. If I'm not too late I'd definitely like to throw my name in the hatter's hat for this one. Awesome. I would love to win! Several years ago I found a note from Wallace Nutting in an old book. The note included a block print that Nutting used as his letterhead and a handwritten note about an upcoming Quaker meeting that he was to attend. Being a shameless capitalist I sold it on E-bay to someone who could enjoy it more than I...and forgot where in the book it had been placed as a page marker. Yay, I'm interested. I love the book. That's a treasure there sir. One I would love to have in my collection. This is fabulous! I'm loving the blog and thanking a facebook friend for sharing. Definitely interested, love the book. I need to win to prove that my luck is changing! I'd like to own this. Yes, please, I would love to enter. Wonderful idea for a prize - even leaving aside the story, Tenniel's illustrations alone would make this worth winning! This is lovely; I've a collection of Alice in Wonderland books. Please add me to the list of interested people. I once found, in the library stacks of a religious college, a set of several dozen thick old (18-19th c.). That wasn't the interesting part. The interesting part was opening them -- apparently nobody had leafed through them in a long time, because I found pressed in them flowers, stems, and leaves, as well as bits of paper and things indicating they were bibles from a mission to China. I don't know if the botanica was Chinese or from "home," wherever that was for the missionaries. I wanted to take a flower, but I left them as I found them. I wonder if they are still there? Count me in. I just found your site via languagehat - fun! Used to sort library donations in a wealthy area and found all manner of weird things. Would love this volume for my oft-described-as-how-can-anyone-have-this-many-books collection. Thank you for your blog--the forgotten bookmarks and unfamiliar books are both intriguing--and I've made sure all my writer friends know about it. Please enter me to win. I love this book. Found someone's link to this while stuck in Bush Int'l. Love the bookmarks and would give multiple hugs to a copy of Alice. This looks really neat. I would like to enter your contest. Throw me into the pot, please! I love your site. I am the chief of leaving ephemera in books I love - four leaf clovers, favorite notes from relatives, old menus and quotes from events I attended. It is anthropology for today. And I certainly identify with Alice. I feel like I am always at the Mad Hatter tea party of life. Thanks! I'm tossing my hat into the ring. Brand new subscriber. Love your kewl bookmarks. Would love to be entered in your giveaway too. Thanks and keep on keeping on!! !